The famous Jagannath temple is situated at a distance of 270 feet to the south-east of the Rasikaraya temple and outside the fort area. According to local tradition, Raja Harihara Bhanja, the founder of the capital city constructed this temple. The date of the construction of the Jagannath temple by Raja Harihara Bhanja may tentatively be fixed around 1630 A.D., when he was ruling after the death of Raja Baidyanath Bhanja. This temple displays the Gaudiya style of architecture. The artistic decorations on the outer walls of the temple of Jagannath have lost much of their beauty. The temple was very artistically painted in various beautiful colours. When Haripur was in a flourishing condition, the Rathayatra festival of Jagannath and Radhamohana, (the deities most honoured in the capital of the Bhanja Rajas) was celebrated with great pomp and gaity and Vardhanapur served as the halting place of the idols. 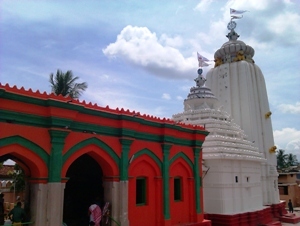 When the temple was demolished, the image of Jagannath, which was formerly placed in this temple, was taken to Pratapapur, where the idol is worshipped daily.